To call James Nguyen a “dynamo” is an understatement. The Saigon-born partner at the Beverly Hills office of Wildman Harrold Allen & Dixon has always possessed a boundless energy. He skipped 7th grade, graduated high school at 16 and finished UCLA in three years. By the time he finished USC law school and passed the bar, Jimmy was just 23 years old. His practice also is bursting at the seams. A self-described “Renaissance man,” Nguyen provides litigation, transactional and general counseling services to a vast range of companies in the fields of entertainment, Internet, intellectual property, evolving media, sports, advertising and fashion. Clients in his cutting-edge practice include BBC Worldwide Americas, Los Angeles magazine, Image Entertainment, Major League Baseball Properties and Sony Computer Entertainment America, among others. 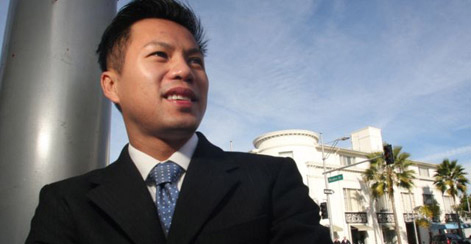 He also represents clients outside entertainment-related areas, such as Kia Motors America Inc.
Nguyen excelled in speech competitions throughout his entire education, starting in elementary school and finishing with moot court in law school. After becoming a lawyer, he helped form the American Readers Theater Association, which promotes the art form of readers’ theater. He is also active in the lesbian, gay bisexual and transgender community. Lawdragon: How did you get into such cutting-edge work? James Nguyen: I chose to get into the Internet and new media fields for two reasons. First, I was a scholar of mass communications in college, and always had an interest in how media technology was used to communicate to mass audiences. If you’re going to practice law, it’s better to practice in fields that fascinate you apart from the law itself. The second was a more practical business incentive. A few years into my legal career, in the late 1990s, I decided to focus on intellectual property, entertainment and media. I needed a way to quickly establish myself – especially as a younger lawyer, and one who was already younger than my peer group to begin with. LD: I noticed that you worked on deals with Hulu and other companies like that – any trends in new media and content distribution that you’re seeing? JN: There is so much that is hot in the worlds of evolving media and intellectual property. It’s almost impossible to fully keep up, but I certainly try to stay on top of all the technology and trends. In fact, earlier this year, I began giving a “2009 State of Evolving Media Address” – it just was a presidential year, after all. In that address, I highlight 10 top trends in evolving media which I see from my perch as industry advisor. Those trends include the rise of high-def digital delivery services into the living room; continued penetration of online social networking services, like Facebook; increased popularity of “sound-bite” communication, such as Twitter; and new content delivery mechanisms via widgets for computer desktops and web apps for mobile devices, such as the iPhone. LD: Do you play video games or have a hobby in any of the areas related to your practice? JN: When I was younger, I was a big fan of video games and comic books. I was born in Saigon, Vietnam. My family immigrated to the United States in April 1975, the night before Saigon fell. Shortly after we settled in the United States, the Atari 2600 video game system took over. As a kid new to this country, I was particularly fascinated and was hooked on the Atari 2600 as a kid. I tried to make my sister play with me, too. I also played arcade games – who didn’t love Tetris? Then I migrated to Nintendo and Sony Playstation, and spent many a day with either Super Mario Bros. or Street Fighter in its numerous incarnations. I also am a big fan of speech, performance and theater. My partner Brian, two of my friends from the college speech world and I are all collaborating together now on writing a musical. A number of the songs have been written, and we’re in the process of working on more songs and the book. I can’t tell you what it’s about yet other than to say it’s called “Limbo.” It’s coming along very well and we seriously hope to one day get it to Broadway. I’ll be excited to work on producing duties when we get to that point. LD: Have your speechmaking talents helped in your career? JN: It definitely helps in court when I’m arguing to a judge or a jury. But that doesn’t happen as often as people think. So my speech experience helps in many other ways on a daily basis. It made me a better and faster writer. It helped me organize thoughts quickly – especially from years of doing impromptu and extemporaneous speaking. It made me become more creative, visual and dynamic in how I present material. And now, I spend a significant amount of time doing speaking engagements on entertainment, evolving media, intellectual property and legal topics. I think I’ve developed a good reputation as an energetic speaker on those topics, and I’m proud to say I get invited to do 15-20 speaking engagements each year. LD: Do you also represent individual artists and athletes in addition to companies? JN: Not many. But one very interesting athlete I’ve represented is Johnny Weir, 3-time U.S. men’s figure skating champion. He’s an incredible talent, and from his public persona, you can tell he’s very fashionable and creative. For Johnny, I’ve advised on some management issues, endorsement/licensing deals and some figure skating tour/performance matters. More typical is my work for a company like BBC Worldwide Americas, Inc. Last year, at BBC’s request, I defended the ABC television network and The Walt Disney Company in a copyright lawsuit in Michigan related to the “Dancing with the Stars” reality television series. I was successful in having the case dismissed, but the plaintiff has now appealed and the appeal is still pending. Stay tuned, as we’re confident the dismissal will be affirmed on appeal. LD: How has it been to always be the youngest in your peer group? JN: It’s been an interesting journey always being the youngest person around – I was the youngest person in my law school class, and during my associate years at a law firm, was always the youngest person in my peer group. And then when I was elevated to partner in my prior law firm, I was definitely the youngest partner for a while. I’m only 36 now, but am in my 14th year of legal practice. People tell me all the time that I also look younger than I am – it must be the good Asian genetics. This can be a challenge when you have to convince clients, opposing counsel and courts that you know what you’re talking about. But it can also be fun when people underestimate your experience level and you can quickly show them otherwise. ©2016 Jimmy Win Media. All Rights Reserved.